Fife offers world-class golf. There are close to 50 golf courses, including the 600 year-old Old Course at St Andrews, the home of golf. St Andrews is fifteen minutes drive from the cottage. Kingsbarns, five minutes drive, is a spectacular championship course, while Balcomie, Crail’s own golf course (shown in the background picture here), is the seventh oldest in the world and was laid out by Old Tom Morris on the grounds of an eighteenth-century course in 1895. 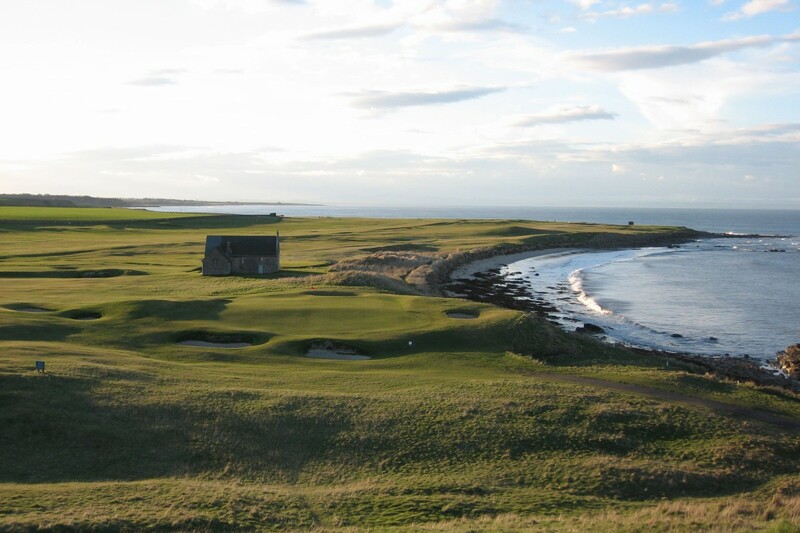 A second Crail course, Craighead Links, was laid out by Gil Hanse in 1998 (Hanse also designed the course for the 2016 Rio de Janeiro Olympics.) There is golf here in the Kingdom to cater for everyone from champs to absolute beginners. For non-golfers there are seasonal trips to the Isle of May for bird-watching (it’s Britain’s best puffin site), from Anstruther. You can also see puffins skimming over the waves in summer (with the help of binoculars kept at the cottage) from our terrace. And you can learn to water-ski, windsurf or sail a dinghy at Elie, or take up sand-yachting on the West Sands at St.Andrews. The Fife Coastal path offers wonderful walking by the sea from North Queensferry to the Tay and runs right past the cottage door. A new inland hiker’s path, the Fife Pilgrim’s Way, is currently being created. History buffs will enjoy a wander round Crail’s Kirk of St Mary’s which has parts dating back to the twelfth century, as well as a morthouse built in the nineteenth century to keep the fresh corpses safe from resurrectionists. There are historic houses nearby such as Cambo and Kellie Castle. ‘Scotland’s Secret Bunker’ is ten minutes’ drive away. Fife is also a gourmet’s delight. There are superb farm shops and delicatessens, and many excellent restaurants within a short drive of the cottage, from the Michelin-starred Peat Inn to the famous Anstruther Fish Bar, and great cafés and brasseries such as Pittenweem’s Cocoa Tree and The Adamson in St Andrews, and our delightful local Crail Food Festival at the harbour. The East Neuk Festival is a small and perfectly-formed week of classical music, jazz and folk as well as some literary events, held every summer, partly right here in Crail. There is a guide in the house packed with local recommendations for restaurants, cafés, gourmet shopping, and things to do, based on our personal knowledge of the area.